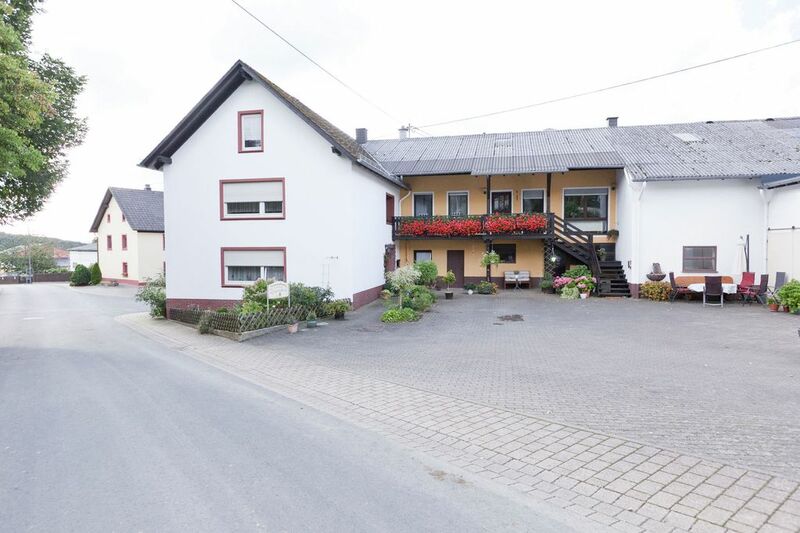 This charming holiday accommodation is in a small village in the Eifel region. The village is near the town of Kerpen. The town has beautiful, historic castle ruins. The accommodation is on the first floor and has a private entrance. It is in a part of the owners house. There is a very spacious kitchen with an adjoining living room. The large balcony has garden furniture. You can venture on wonderful walking and cycling trips in the countryside straight from the house. The famous Nürburgring motor racing track is 24 km away. The Dauner Maaren, a delightful nature reserve with volcanic lakes, is 18 km away. The town of Hillesheim is 5 km away. You'll find a variety of restaurants and supermarkets and the local tourist board office there. Spacious house, very nice couple, flowers on the table upon arrival, free firewood. Nice house uitvals base for exploring the area. We spent a week in this house. The owners are extremely friendly and very helpful. Everything was delicious. The area is quiet and there is a short 10 minute drive a nice village (Hillesheim) with good supermarkets, restaurants and other facilities available. The immediate area is especially suitable for walkers and tranquility. Really a must. Open haard brandde. Toch koud en rokerige lucht in de woonkamer. Eigenaresse knorrig wilde wel hout geven 1 maal per dag 1 mand. Dat was niet voldoende om het goed warm te krijgen. Twee manden voldeden wel. Omgeving rustig en mooi. Uitzicht op andere huizen. Toen we on 17.00 arriveerden brandde de open haard al. Ruim huisje. Van alle gemakken voorzien oven, magnetron, fondue en gourmetstel, waterkoker, koffiezetapparaat. Elke dag nieuw hout voor de open haard bij de deur. Vriendelijke eigenaren. Comfortabele bedden.